San Antonio hip-hop. To those who haven’t been paying attention, the juxtaposition of that particular genre and the Alamo City might seem odd ... at first. But it hasn’t stopped local rhyme-sayers and beat-makers from pursuing a particular style of music that resonates with them regardless of how often their shows get promoted by local media (help us help y’all change that). 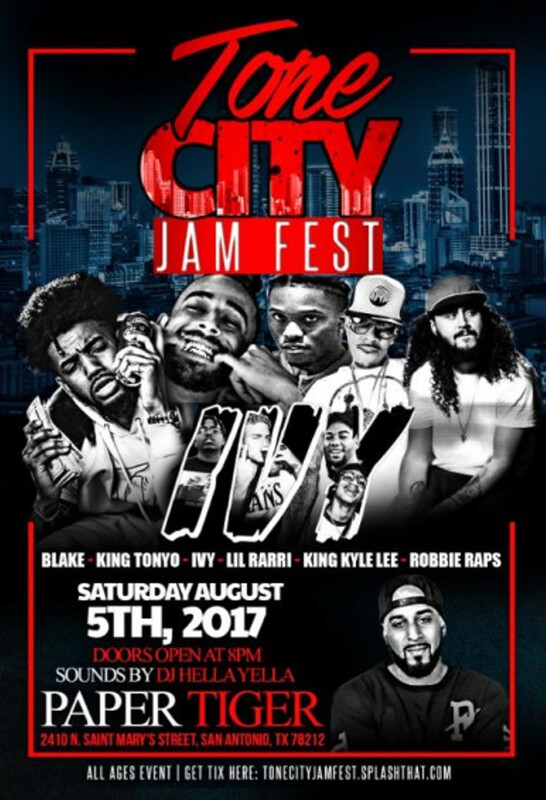 One of these shows is Tone City Jam Fest, which features a few of the best local rappers who are steadily creepin’ on a come up, including, King Tonyo, Blake, and Robbie Raps to name a few. For a taste of the quality talent SA’s been cookin’ up on the hip-hop end of our indie rock-heavy music scene, this is a show you’re gonna want to be at. With DJ Hella Yella, Lil Rarri, King Kyle Lee and IVY.